Few poetry reading series live to celebrate their 16th birthday and even fewer make it out of cozy bars and bookstores and into the wider world. But that’s exactly what Beat Night at The Press Room will be doing later this month. On Thursday, March 19, the series celebrates its anniversary with a special program featuring 16 of Beat Night’s favorite local poets. Mike Nelson, Beat Night’s current curator and host, has plans for the series to branch out and spread the Seacoast’s spoken-word tradition far and wide. The anniversary show doubles as a fundraiser for Tribe Poetry Project, an educational initiative that brings music and poetry to schools in New Hampshire and abroad. For the uninitiated, Beat Night features writers reading prose and poetry while backed by a live band. The series has already inspired dozens of spin-off events and anthologies — just last year, Nelson released “View from the Mic,” an audio album collecting a range of past Beat Night performances. 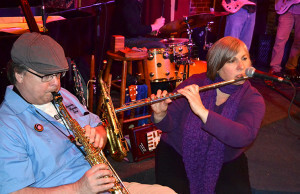 Dozens of writers and musicians have found an artistic outlet at The Press Room each month. Go to Beat Night and you’ll see everyone — the readers, musicians, and audience — lost in the rhythm of words and music, enchanted. The Beat Night Band performs at The Press Room. Nelson is using Tribe Poetry Project to bring that feeling to the rest of the world. This month’s Beat Night features readings from former Portsmouth Poet Laureate John Michael Albert and former Rochester Poet Laureate Andrew Periale, among others. Because the event is so packed with poets, it will start an hour earlier than usual, at 6 p.m. There will also be a raffle, with prizes donated from local businesses and friends of the series. Unlike most 16-year-olds, Beat Night is paying its loot forward; all proceeds from the night will go to the Light and Leadership Initiative (LLI) in Huaycan, Peru. LLI’s mission is to empower impoverished women and children through free educational programs. Nelson recently came back from a volunteering trip to the LLI school, where he worked with the English students on their poetry. The school served as the first site for Tribe Poetry Project. “Some kids already had notebooks full of poetry. They just didn’t have any place to read it. … The response was incredibly positive,” said Nelson. He added that many of the students have incredible stories to share, but their voices are often underrepresented. With Beat Night as his model, Nelson is using Tribe Poetry Project to provide people with a forum to share their wisdom and common experiences. “It harkens back to the tribal circle of sharing customs. … There aren’t many places where people can just go up to a mic and speak their story to a room full of people who are there to listen,” said Nelson. 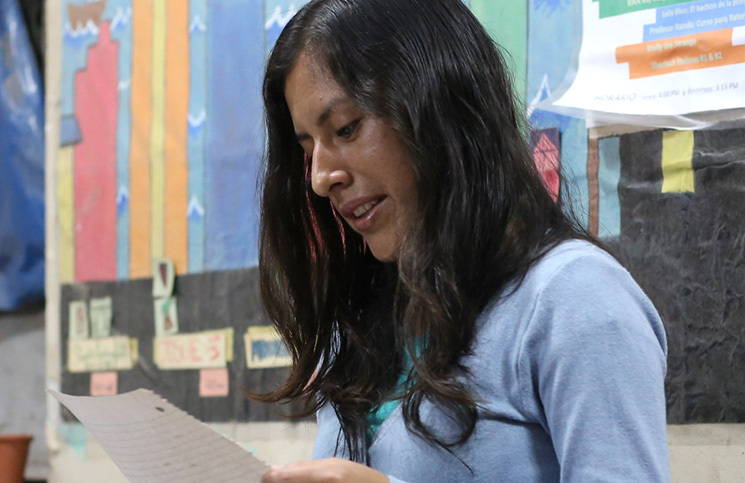 Yeni, of Huaycan, Peru, reads a poem as part of a Tribe Poetry Project event held there. After having seen the benefits that sharing music and poetry has for individuals and the community, Nelson said he’s committed to recreating the Beat Night experience elsewhere. According to Nelson, the money raised through an online fundraising campaign and this month’s Beat Night will go toward helping the LLI continue its poetry workshops and reading series, with a long-term goal of acquiring computers and printers to publish the students’ work. Tribe Poetry Project’s next target is a little bit closer to home. Nelson works with a group of teenagers in Manchester each week at the Organization for Refugee and Immigrant Success, which helps immigrants assimilate into American culture. He thinks poetry and music can help with those efforts. “They are going through a huge cultural transition and there’s so much possibility for cultural connection there,” Nelson said. He’s also getting the students and their poetry out of the classroom and into the community by bringing students into the city’s poetry scene through poetry events like the weekly Slam Free or Die series at Milly’s Tavern in Manchester. According to Nelson, adding a new diversity of voices into the local scene has been eye-opening for both new readers and old. The Seacoast is rich in poets and poetry, and with Tribe Poetry Project, Nelson hopes to spread some of that wealth.